Question: I currently have the GeoBlue Navigator policy and it is due to renew on 12-1-2013. I have two questions. First, when is the last day for me to send in the renewal form to you? Second, am I active for the month of December if I have not yet turned in my renewal form to the insurance company? Answer 1a: You have up to 30 days to renew your current active GeoBlue Navigator policy. This works just like renewing your car insurance or paying for your U.S. health cover here in the U.S. You have up to the end of the month to pay/send in the renewal and pay. Answer 1b: Please keep in mind that it takes about one week for the policy renewal to be completed, once in our office or the insurance company’s office. Also please keep in mind that if you have not heard from either us or the insurance in under 48 business hours from the time you sent your renewal (via email or fax) then we have not received it. We always respond with a “thank you” email that we have received your renewal form and will be processing it pronto. Answer 2a: No, your policy is not active if you have not sent in your renewal form in and has been processed prior to 12-1-2013. The insurance company as well as Good Neighbor Insurance emails you your renewal policy between 45-60 days prior to your renewal date. Answer 2b: This works just like insurance in the U.S, such as car insurance or even health insurance. In fact, for U.S. health insurance cover, on the 11th of the month if the payment is not in the health insurance office the “on” light for active health coverage is turned “off.” Thus, if a medical office on the 11th of the month calls into the insurance company to verify coverage the insurance company will say they are not covered. The policyholder has up to the end of that month to pay or the policy will be cancelled. However, technically, the policy is not active unless that monthly premium has been paid. Answer 2c: Sending in the renewal form allows the insurance company to debit for the stated amount for that month. Thus, no payment on December 1st onwards means your policy is not active. Question: am not sure why we have to renew in order to keep our international career policy with GeoBlue active. Can you explain the reasoning behind This? Answer: This is a great question and one we get quite often. Yes, the renewal form with GeoBlue is related to U.S. federal law and not insurance law. The U.S. government wants to verify that you are still on an international career insurance policy. In order to have applied/been accepted with the GeoBlue career plan you have stated that at least the first year on the policy you are an expat or will be/have been residing outside the U.S. for 3 months or longer. Each year at renewal you will need to verify that you will be residing outside the U.S. at least 3 months per year. Question: Where can I find the GeoBlue app? 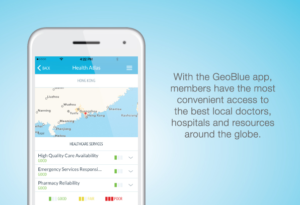 Answer: The latest version of the GeoBlue App includes the Health Atlas, a popular feature of the Destination Dashboard. The Health Atlas helps those insured through GeoBlue international health insurance manage their medical conditions and assess health and safety risks in hundreds of destinations. Members are using it to find vital information related to available healthcare services and environmental risks. Available from iOS app store, Android play store, and Amazon.